You have let me down. This has never happened. It was just one of those days in the studio, which was super productive. However, many crazy thoughts swirling in my head and I could not control them. Usually the people singing drown out my negative thoughts and inspire my creative spirit. Today “Higher Love”, “She’s Waiting”, and “Cowgirl in the Sand” were just songs playing on the CD. 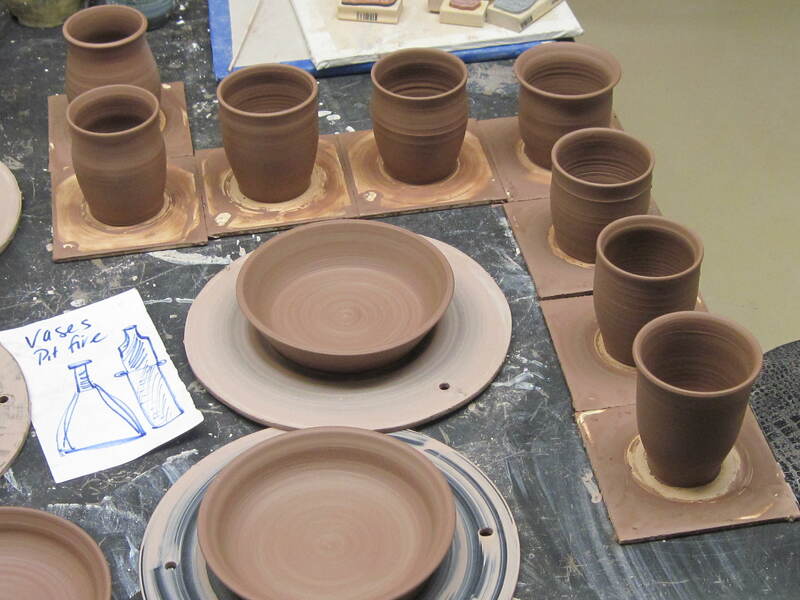 A good friend of mine told me I have a professional business and I promote other artists and potters. What a nice compliment. This is true. 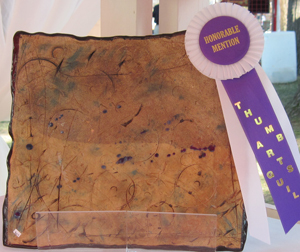 At all of my sales and shows at my studio I have featured over 12 potters and dozens of artists including jewelers, painters, photographers, wood workers, fiber and paper artists in the last five years. We need to promote the arts and I love doing that. I also print two post cards a year with a quantity of 2,000 each with show dates of local shows. However, it is crazy when some people cannot see the big picture and do not approve. I figure it is their loss; no more free advertisements. Silly people! At the Marysville Art in the Park show this past weekend, a customer asked if I had made a bowl she purchased a few years back. 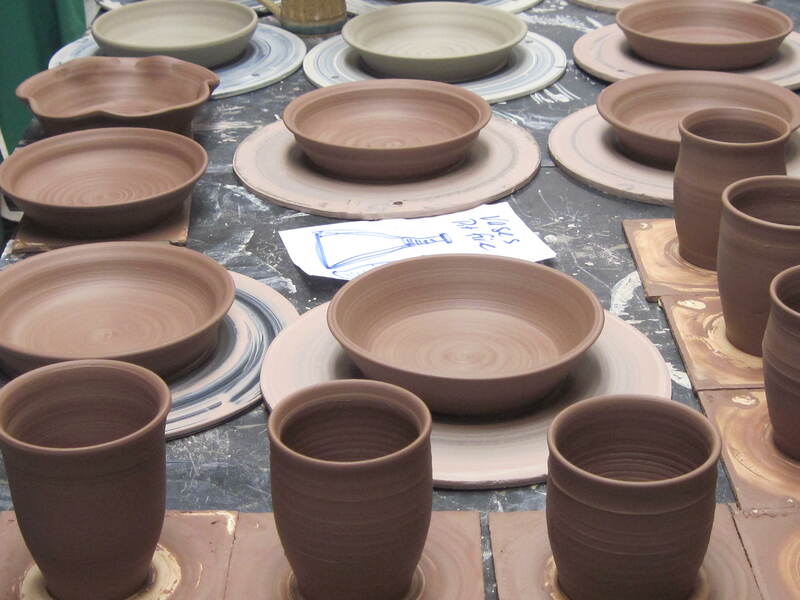 After she described it, I knew Duane Collin had made the batter bowl and I gave her a post card and told her that he will be at the next show. 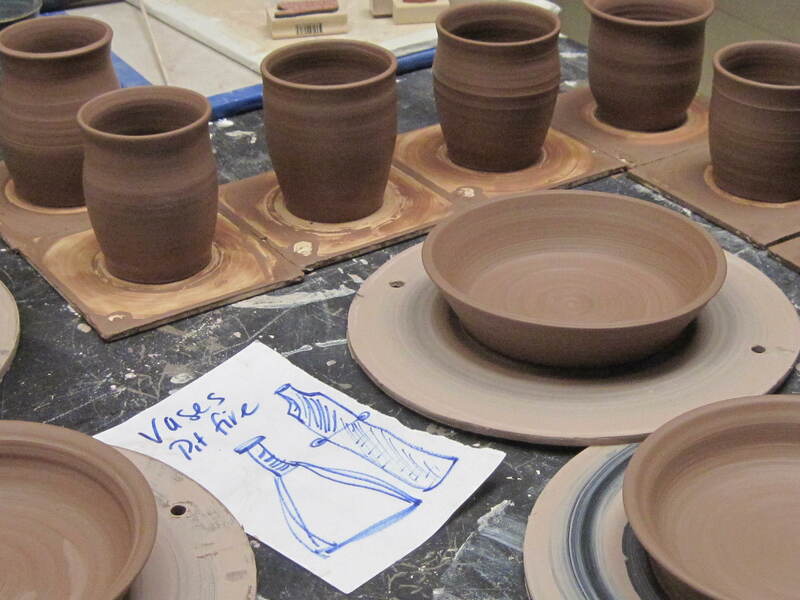 I think Duane is the best potter in St. Clair County. Another customer wanted tall mugs and I told her she saw those mugs at my show but Laurie Conger makes the best mugs with the best handles. I gave her my postcard and told her she will be at my holiday show. 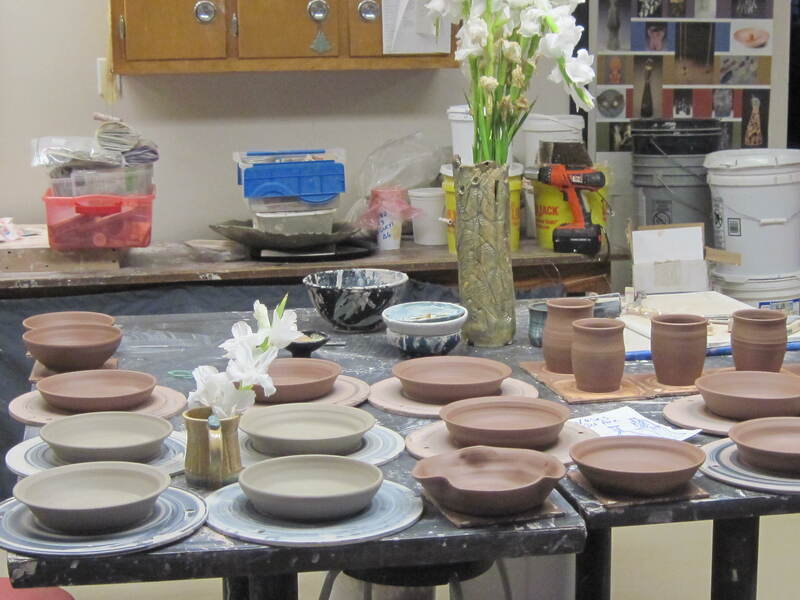 I think Laurie Conger is the best potter in the thumb area of Michigan. Why do people see this as competition? I like to think everyone should help the next artist to get a sale. Another good friend of mine told me nice girls finish last. Can this be true? I need positive reinforcements that all of my hard work has been the right thing to do. Maybe it is just one fly in the ointment not looking at the big picture. Good thing we all are entitled to our own thoughts. Maybe I need to think twice about going out of my way to help others. Too bad those people who reaped the benefits have short memories. I am sure Steve, Eric, Neil will be back in the saddle tomorrow, and all will be right with the world! Its official! 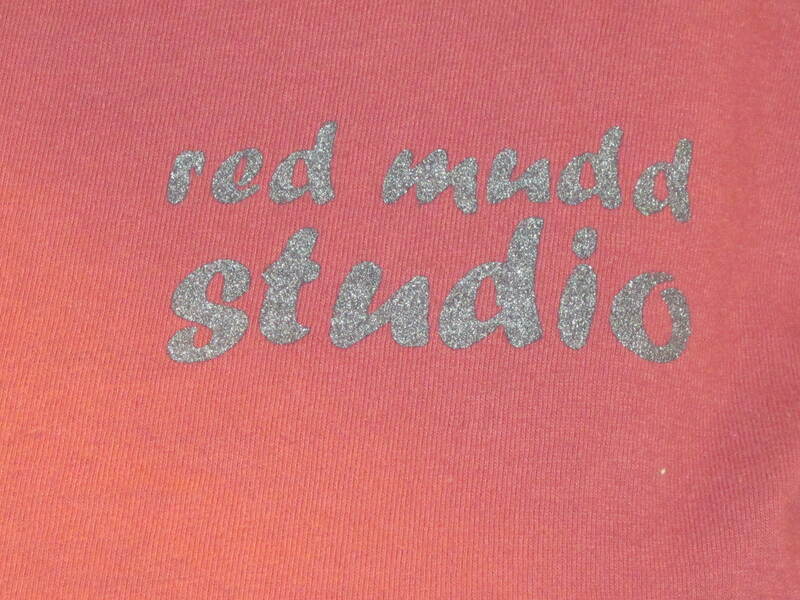 Red Mudd Studio has it’s first Groupie! I designed a new t-shirt and decided to give them away to good customers or make them available for sale. 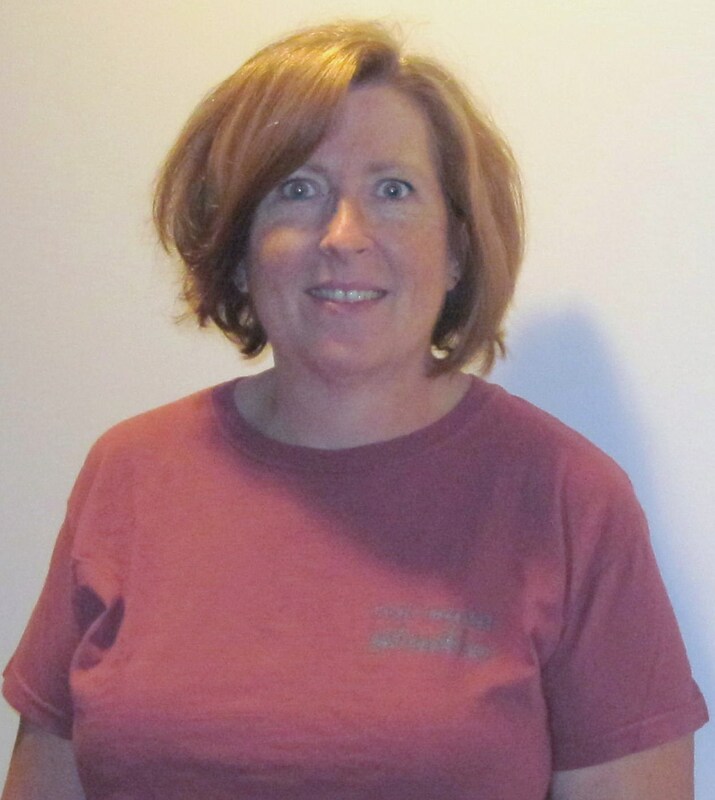 This past weekend my very good friend Mary Lou bought the first official t-shirt at Marysville Art in the Park. How awesome is that! I had the ARC of St. Clair County print them and they did a great job. Instead of the bright red t-shirt I decided I would get the more eco friendly vegetable dyed shirts that come in every shade imaginable. I did print two bright red shirts with black ink for Brad and Dave, which both wear that color well. For the rest of us, we can choose from some pretty pinks, clays, browns, raspberry and soft reds. Also, the cut is a women’s design and it is not so big. 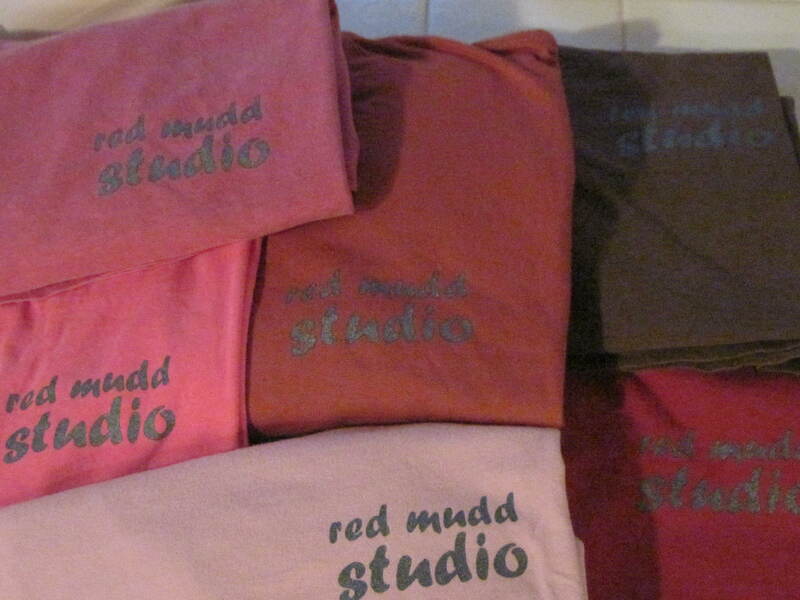 Each shirt is 94% Ring Spun Cotton and 6% Organic Ring Spun Cotton with “Red Mudd Studio” printed in a slate grey ink for only $10 each. Currently L and XL are available. Special orders welcomed, email me and I will give you all the details, including shipping and handling. Raspberry red t-shirt only $10! Most people have a good memory, I don’t. The only time I can recall details is when the subject matter relates to my family and my work, and then it’s a little shaky. 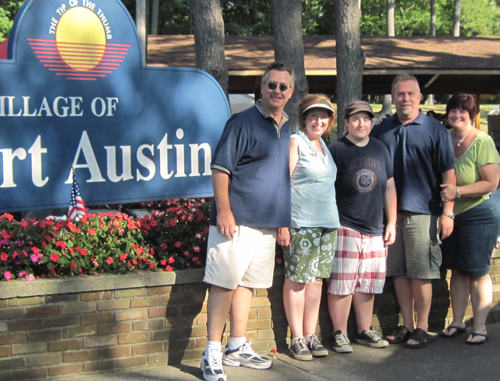 Last year in Art in the Park at Port Austin, MI, a couple with a college aged son visited my booth. The gentleman asked if I was here last year because he remembered my work. My brain went into over drive and I said “Yes, don’t you have a son attending Eastern MI University, and he purchased a sushi tray?” The wife’s head whipped around and shouted “How can you remember that?” We chatted for awhile and the son purchased another sushi tray. In reality, when someone comes up to me and asks “Remember the blue bowl I bought?” Uhh, not really I make about 500 blue bowls a year. But if we talked about my passion I can recall the details. 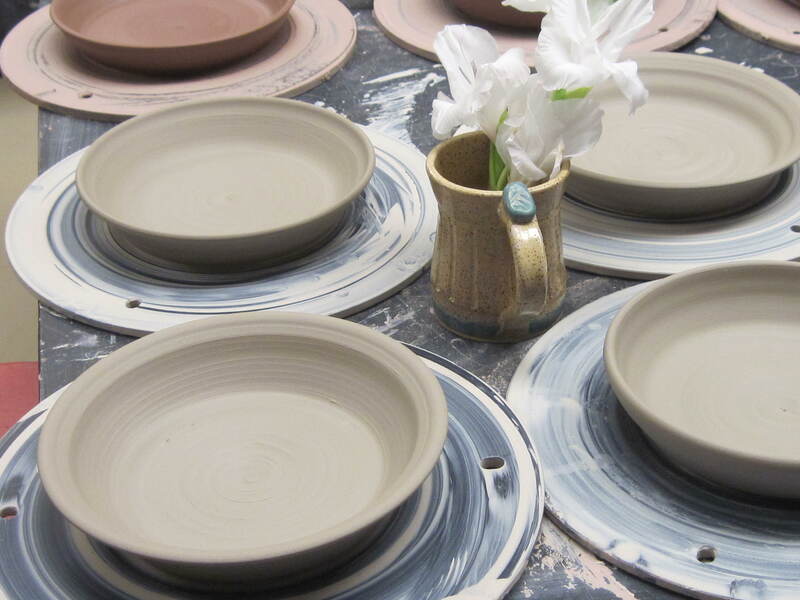 So at the end of the conversation with the nice couple from Yipsi, I confessed I can’t remember if I put on my deodorant this morning, but I can remember what piece of pottery you purchased. Really now, what’s more important? 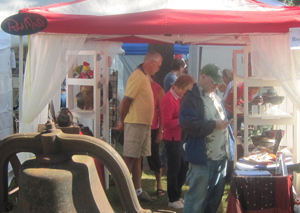 Stop by and visit me at Gallop Park located in Port Austin, MI on Labor Day weekend, Saturday and Sunday from 10 am – 5 pm. Look for the bell, I’m next to it with the red tent!